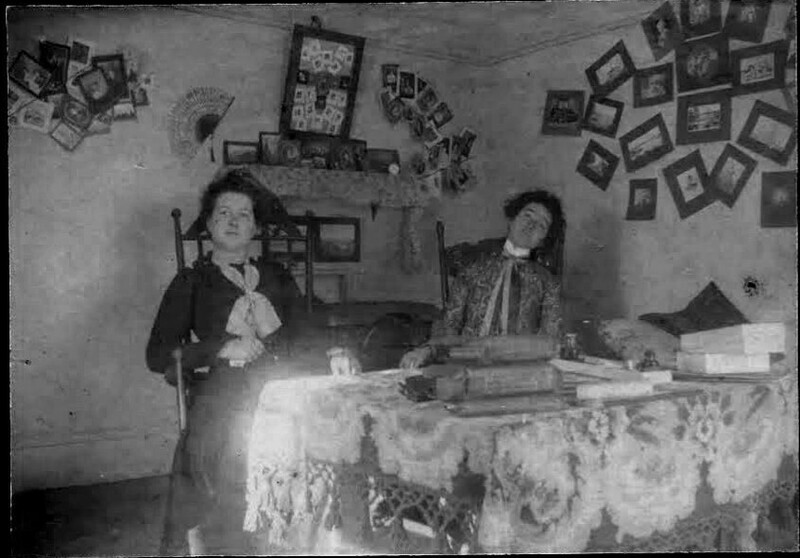 January 1, 1901 photograph of Martha Whitney and Vivian Kenniston, presumably taken at Eastern State Normal School at Castine, Maine, which both attended. The room they're in has the appearance of a dorm room. Martha Whitney was presumably Martha Norton Whitney, daughter of Calvin G. and Mary S. (Allen) Whitney of Jonesboro, Maine. 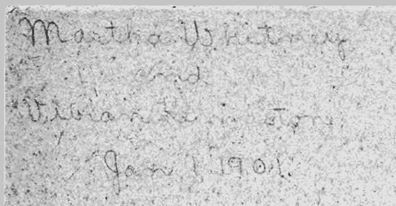 Martha married Frederick Jones Wight, a native of Medfield, Massachusetts, at Jonesboro, on December 25, 1908. Fred, born December 16, 1872, was the son of Jonathan Gardner Wight and Jane (Morehead) Wight. Martha and Fred lived at Medfield, Massachusetts, and, later, Millis, Massachusetts; they had, I believe, three children, two of whom were twins. Martha and Fred are buried in the Vine Lake Cemetery at Medfield, Massachusetts. Vivian Inez Kenniston was born September 27, 1881 at Amherst, Maine, the daughter of Seth Albert Kenniston and Marion Ethel (Williams) Kenniston. On December 6, 1901 at Amherst, Maine, Vivian married Edwin Solon Conner, son of Fred Morton Conner and Helen M. (Peterson) Conner of Penobscot and Castine, Maine. Edwin, a graduate of both Eastern State Normal School and Bates College, taught school in Maine and Ohio. He and Vivian had, I believe, three children. Fred died in Florida in April 1960 and Vivian at Castine, Maine, that same year in June. They're buried in the Castine Cemetery. If you have corrections and/or additions to the information provided on either Martha or Vivian, or both, please leave a comment or contact me directly.